A poll of 2000 British gamers uncovered several major gaming landmarks that revolve around a single spectacular year. The ideal of a perfect Golden Age isn't restricted to religious or political ideologies. Gamers frequently use the term to reference a time when games could do no wrong, before greedy publishers / DRM / filthy casuals ruined it for everyone. Trouble is, not everyone agrees on when exactly this Golden Age occurred. Our own Yahtzee Croshaw dates it to the PS2 era, while Infinity Blade's Donald Mustard thinks we're living in it right now. Both made some good arguments, but what about the broader gaming population? British retailer GAME attempted to find a more definitive answer, polling 2000 gamers on their favorite titles and consoles. 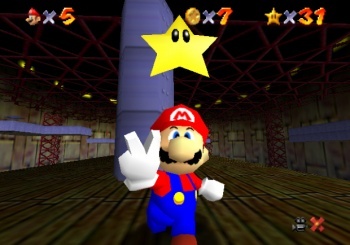 Once the results were tallied, GAME was able to pin down 1996 as gaming's best year by a 1% margin. There may be other years that you prefer, but its pretty hard to argue against the volumes of gaming history from '96. It was the year that introduced the Nintendo 64, and Super Mario 64 along with it. 1996 also gave us Tomb Raider, Resident Evil, and an iconic shooter called Duke Nukem 3D. Japan saw the first appearance of Pokemon, RPG fans got Diablo, while sports gamers discovered FIFA 96, the first successful football game to use athlete's real names. And the list keeps going. 1. 1996 (14%): Tomb Raider and Crash Bandicoot on the PlayStation and Nintendo 64 launched. 2. 2002 (13%): Halo and Elder Scrolls III on the Xbox and Grand Theft Auto Vice City. 3. 1991 (12%): Street Fighter II and Super Mario World on SNES and Lemmings was out on the PC. 4. 1985 (11%): Super Mario Bros, Duck Hunt and Donkey Kong Jr on the NES and Ultima IV and Oregon Trail on the PC. 5. 1980 (10%): Pac-Man and Centipede in the arcade, Space Invaders on the Atari 2600 and Zork on the PC. "When you look back at some of the iconic titles released in 1996, it's not hard to see why it topped the poll," said IGN's Tom Butler. "With Tomb Raider, Resident Evil, and Crash Bandicoot, Super Mario 64, Pokemon Red & Green, Duke Nukem 3D, Diablo, and The Elder Scrolls II all out in the same year - 1996 was truly a vintage year for gamers." While 1996 made first place, it's worth noting the year won by an incredibly narrow margin. Multiple gaming generations encompass that top five list, with 1975 eventually coming in tenth thanks to the historic Pong. As with most of our hobby, it seems that Golden Ages are far more subjective than one might initially expect. Still, no 1998, Britain? Half-Life, StarCraft, and Zelda: Ocarina of Time don't warrant the top five? That's a strange kind of Golden Age you've got there. Strange, indeed.